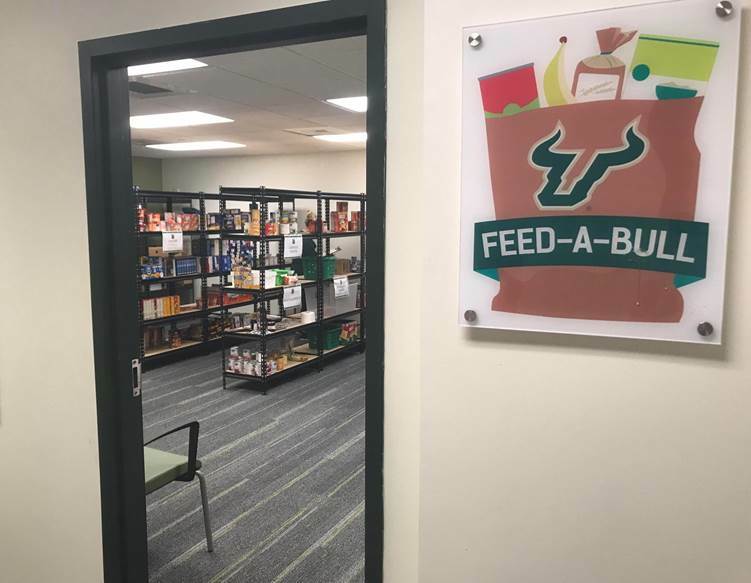 Feed-A-Bull, the USF Tampa food pantry, has distributed more than 24,000 pounds of food to students in need. (Nov. 21, 2018) – A student-driven initiative to establish a food pantry at USF St. Petersburg could help fend off hunger for students living with food insecurity on and off campus. Lead by undergraduates in Ingrid Brendenberg’s Leading Diverse Teams class, the proposal could see USFSP adopt a food pantry similar to Feed-A-Bull, the USF Tampa food pantry that has distributed more than 24,000 pounds of food to students in need. Studies paint a troubling picture of food security on college campuses. Up to half of all undergrad students experience food insecurity, according to a 2017 study. This year researchers found that nearly 30 percent of college students are hungry nationwide. Along with classmates Galina Gorelenkova, Melanie Olmo, Joanne Rivera and Sarah Stanaland, Miller set out to create a proposal modeled on USF Tampa’s Feed-A-Bull program. Their proposal involved establishing a safe space for collection and distribution; raising awareness about food insecurity, poverty, and health at USFSP; and encouraging other students to get involved with the food pantry. There are many apparent benefits of food security—from better nutrition and mental health to improved focus in class and higher GPAs. The food pantry proposal will now be taken to the university leadership for approval before seeking possible funding routes and a location.